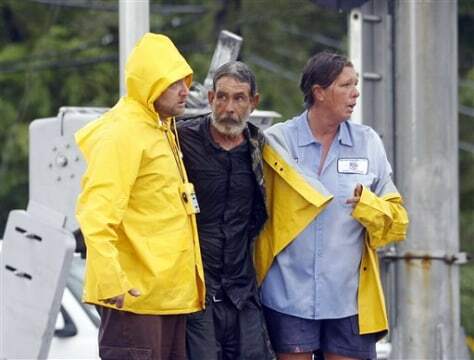 In this Aug. 30 photo, Larry Bailey, center, found in floodwater caused by Hurricane Isaac, is helped to safety in Slidell, La. When a Florida man saw the news photo of Bailey, who at the time was unidentified, he was sure it was his brother. It wasn't — but the mistaken identity started a search that ultimately reunited Bailey, who has been homeless, with the two daughters he hadn't seen in 16 years.